And where to get the look. It’s that time of the year again: college move-in day. Aside from stocking up on the necessities, each and every year, college students will spend (or have their parents spend) an egregious amount of money on Insta-worthy dorm decor. Even with cinder block walls and dull wooden furniture, some college students manage to make their small rooms a work of art with a little wallpaper, twinkling lights, and patterned bedding. Luckily, it’s possible to get similar looks to these dorm room transformations without spending a fortune. We dug through Instagram to find the most trending dorm rooms out there and found out how you can get a similar look for less. Light, neutral colors make a subtle statement in this Alabama dorm room. Extra sheets were used to cover up any unruly storage under the bed that frees up more space in the room. Plus, you can never go wrong with some lights strung. A lofted bed is the perfect way to give the space for a lounge area underneath. This one has a boho vibe with a tapestry, patterned pillows, chest, and plants. Talk about the perfect study space! Contrasting concert posters and album covers give this corner of the room a cool girl vibe. The twinkling lights provide a nice glow that makes this spot the ideal place to nap in between classes. Those tiny twin beds can double as couch-like lounges when pushed against the wall and loaded with pillows. This room created even more storage by doubling storage cubes as a headboard and added some color with wallpaper. This dorm room is both light and whimsical. 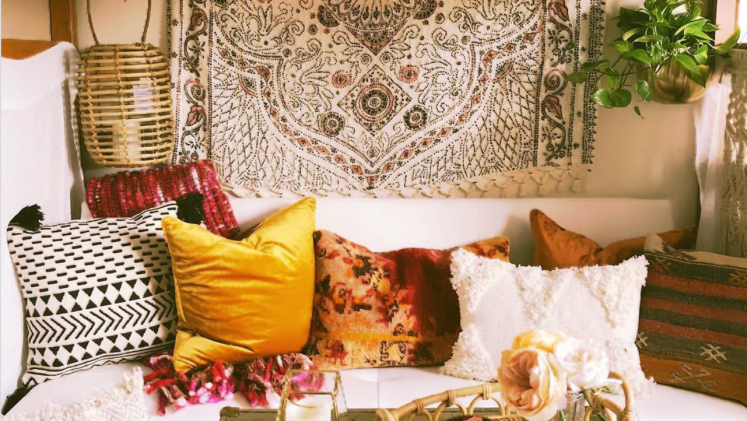 Everything from the bedding to the curtains to the tapestry hanging is loose and brings some bohemian vibes. To get extra crafty, a wooden wall art was used as a headboard to give the room more of a homey feel. Most dorm room furniture is bland, boring, and sore on the eyes. But this room gave that drab desk an upgrade with some marble printed wallpaper. It’s an easy way to give the room a facelift without spending too much. There’s nothing like making a statement. This room is decked out with a sparkly monogram and pillow that stand out amongst the pink bedding and furniture. It’s one way to claim your side of the room. Dorm rooms are tiny, so it’s important to maximize your space by moving furniture. This room has a lofted bed making room for a desk underneath to allow for more room elsewhere. The mirrors on the top half also give an illusion of a larger space. This dorm room is filled with personal mementos. With Polaroid pictures of friends hanging and stuffed animals from home, it’s filled with simple reminders of where she came from.